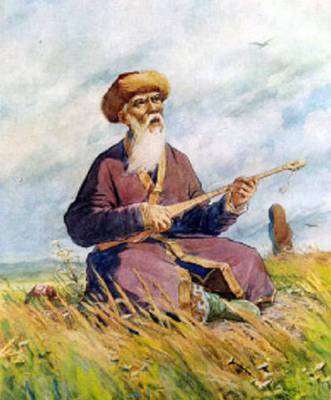 Folk songs occupy a special place in life and music of Kazakh people. Akyni (singers) sing songs with music accompaniment. The main national instrument is dombra, stringed musical instrument played by plucking. Singers are very popular among the Kazakh and they are welcome to any party. Akyni shared their history, life and problems through songs. They often take part in music competition - aytish, where 2 or more akyn composed and performed these improvisations on the spot. The winner is a singer that can impress viewers by his bright song, music and create the best improvisation. The work of akin is very difficult – he must have good memory and associative abilities. In the past folk songs existed solely in vocal form. Singers learned music and songs by repeating orally the music of other musicians. That’s why they became not only translators but also creators of new song. The brightest piece of music was wedding song. The most popular was “Jar-Jar”, “Koshtasu”, “Tanisu”, “Toy bastar” and others. There were special songs and even whole collections for funeral: “Jilau”, “Dauis”, “Jiirma bes” and others. There’re a lot of singers around Kazakhstan. But the most famous are Kenen Azerbaev, Estay Berkimbaev, Akhmet Baytursinov, Akhan-sere Koramsin, Birjan Kojagulov and others. But the real pride of Kazakh is Abay Kunanbaev. Many schools and universities have his name, there’re also monuments of the singer in different cities of Kazakhstan. Other posts from the rubric Kazakh culture.